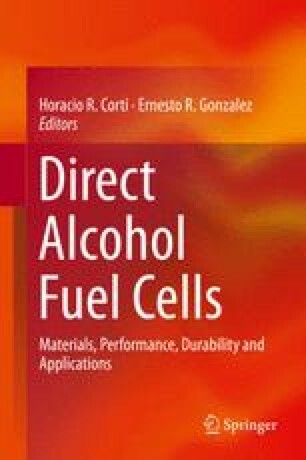 This chapter is devoted to summarize and discuss the main properties of ionomeric membranes used in direct alcohol PEM fuel cells. Although Nafion is the proton exchange membrane commonly used in methanol and other direct alcohol fuel cells, other proton and alkaline membranes are being investigated in order to improve the efficiency of DAFC. The goals in the development of this critical component of DAFC are: low cost, long durability, low alcohol permeability and high electrical conductivity. The last two properties can be combined in a single parameter, the membrane selectivity that accounts for the ratio between the proton and alcohol transport through the membrane. This parameter can be compared to that measured for Nafion to define a relative selectivity, which is a primary parameter to evaluate the potentiality of a ionomer material to be used in alcohol feed fuel cells. The vast catalogue of polymeric materials reviewed here included Nafion composite with inorganic and organic fillers, and non-fluorinated proton conducting membranes such as sulfonated polyimides, poly(arylene ether)s, polysulfones, poly(vinyl alcohol), polystyrenes, and acid-doped polybenzimidazoles. Anion-exchange membranes are also discussed because of the facile electro-oxidation of alcohols in alkaline media and because of the minimization of alcohol crossover in alkaline direct alcohol fuel cells. The performance of different types of membranes in direct alcohol fuel cells, mainly methanol, are summarized and discussed in order to identify the most promissory ones. The lack of correlation between the relative selectivity and fuel cell performance of the membranes indicates that the architecture of the three phases region is a decisive factor to take into account in the design of enhanced performance membrane-electrode assemblies.